Two recent letters, one criticizing conservatives for all manner of faults, the other describing Trump’s banana republic, deserve a response. While both have some element of truth, neither has perspective. Here is that perspective from a conservative viewpoint. Are Americans safer because the Middle East is on the verge of a chain reaction of nuclear proliferation? Will we be safer as Saudi Arabia, Turkey, and Egypt develop their own nuclear deterrent to counter Iran which, through collaboration of the previous administration, is on a firm path a deliverable nuclear weapon. The answer is an emphatic no. Regarding the social programs the liberals so emotionally defend, will our economy, with ever increasing levels of taxation on a narrow band of society, be able to support and sustain them? With well over $100 trillion in unfunded liabilities (national debt and unfunded entitlement spending such as Social Security, Medicare, and Medicaid), there is no conceivable way that we can continue on the current fiscal trajectory without Argentina-like consequences, an economic dislocation to make the 2008 crash look trivial. The evil one percent just do not have the assets for us to tax our way out of this impending disaster brought on by liberal dreams (and occasional conservative complicity) from FDR to present day politicians. And the criticism of conservative economics also rings hollow, backed by suffocating regulation, counterproductive environmental zealotry, and a mentality that deems successful enterprises as the enemy. Trump won the election because liberals (and truthfully, conservatives) have turned a blind eye to the industrial wasteland that the heart of the country has become. In spite of this electoral earthquake, there is still no acknowledgement, no movement from the left to address the economic malaise we are experiencing. As to the banana republic that magically appeared on Jan. 20: Where were you during the last eight years as the attorney general was censured by congress, as the IRS was weaponized into a tool for suppression of political activism, as our foreign policy collapsed around the world, as the void we left facilitated ISIS, as the national debt doubled, as racial tensions ramped up due to lack of leadership? The Comey firing? Both sides wanted it. He deserved it, having given Clinton a pass on exposure of classified information, having usurped the authority of the attorney general, and having elevated himself from law enforcement to politics. Trump’s fault is a matter of miserable timing and his obligation, now, is to appoint a pristine candidate who will guarantee that the FBI stays out of the political realm. Should we call our congressmen? We should absolutely ask that they cease the hysterical obstructionism, that they not declare treason before the facts are known, that they offer an alternative to the administrations policies that are rational and fiscally sound. The biking season is underway in Summit County, and my dog and I have already come close to being hit by a silent bicyclist whizzing by. 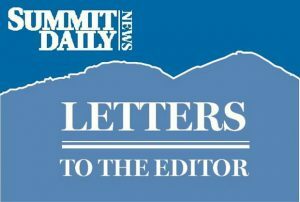 Why is it that the rec paths (so termed because they are for shared use) in Garfield, Pitkin, and Eagle counties and Estes Park all take the safety of their rec paths more serious than Summit County does? Each of these places have posted signs with large print at periodic intervals stating “CYCLISTS MUST GIVE AUDIBLE SIGNAL WHEN PASSING OTHER TRAIL USERS.” Garfield County has large yellow warning signs painted onto the rec path in addition to their posted signs. In the interest of preventing accidents and conflicts between pedestrians, dogs and cyclists, Summit County and/or each town within this county needs to put adequate warning signs up at periodic intervals. Silverthorne has small rec path user signs that have a warning for cyclists, but it’s in small print the 5th bullet point down. No cyclist whizzing by is going to see and read this as they go by. It’s completely inadequate and does nothing to mitigate a dangerous situation. It is incumbent upon every walker with or without a dog and/or stroller, and every runner, to keep to the right and exit paths to the right. I have seen many of these important messages on signs elsewhere too. Dogs can’t read but their owners can. In the interest of safety for all, let’s all do our part.